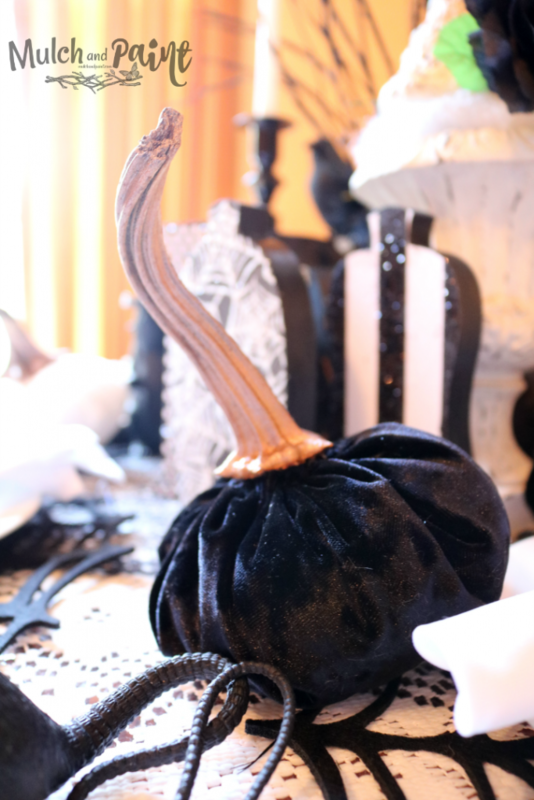 I just finished a great black and white tablescape and used some velvet pumpkins I made. Is it spooky enough? 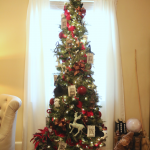 Most of these decorations are from my mantle decor from last year. You can see it HERE. 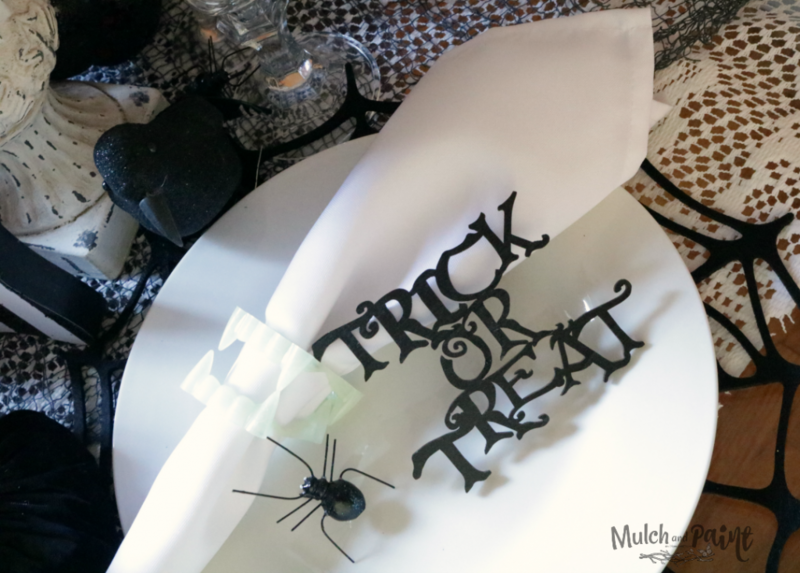 I also showed how I made these cute BOO decoupage wood signs that I bought from Hobby Lobby. 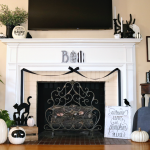 This year, I decorated my mantle with a simple gold and off white Fall theme so all of the black and white Halloween decorations needed a new home. 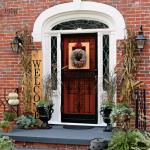 I don’t like skulls, spiders, rats or blood–but this time of year it is fun to bring out some spooky decorations. I am a yard sale junkie. I don’t get to go to yard sales as much as I’d like but I try to make time to hit large subdivisions when they have neighborhood sales. 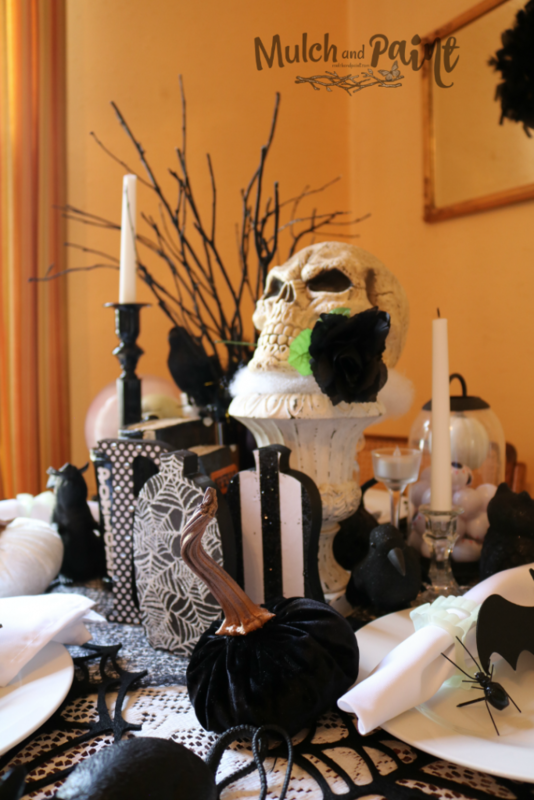 This past Spring, I found a nice lady at a neighborhood yard sale who had a huge amount of Halloween items for sale at great prices. 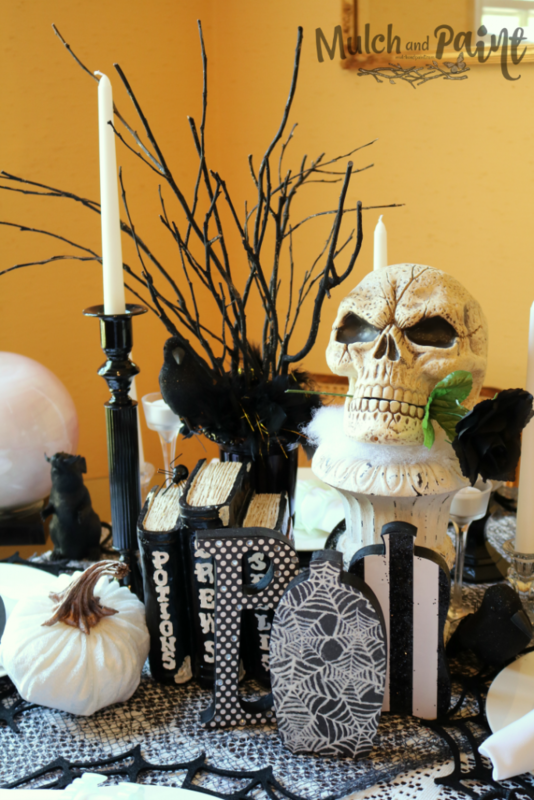 I got a lot of things I probably wouldn’t have normally used for decorations–but they looked fun and I thought I’d work them into my decor in some way. 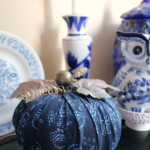 I had a decorative urn that once had a floral arrangement in it. 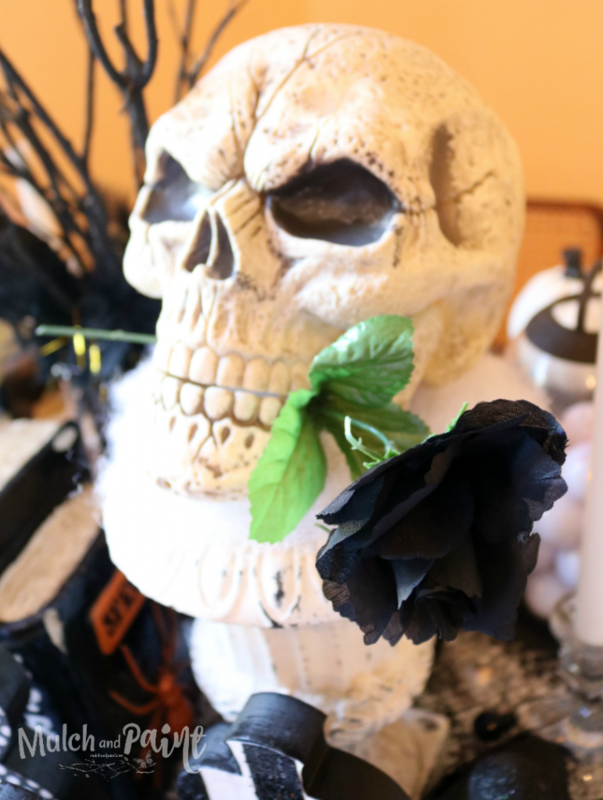 I pulled out the old flowers and used it as a stand for the skull centerpiece. 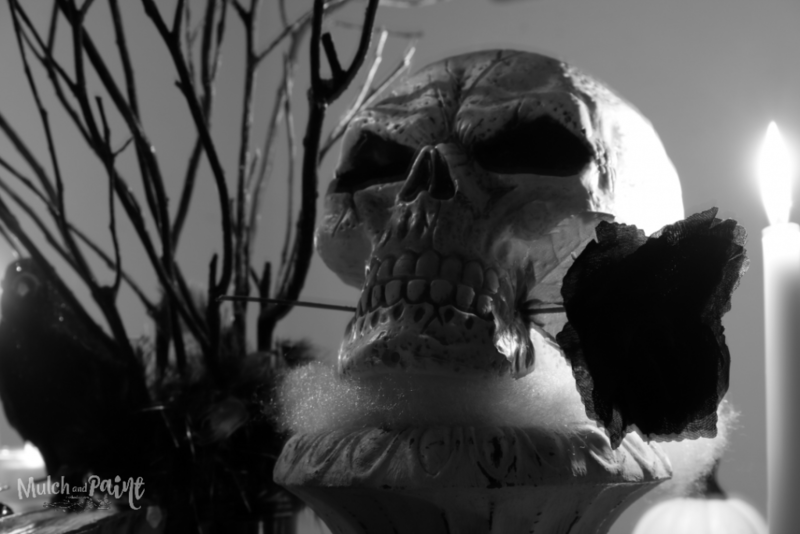 A little fake snow from Christmas decorations was used to sit the skull on to give it a smokey look. 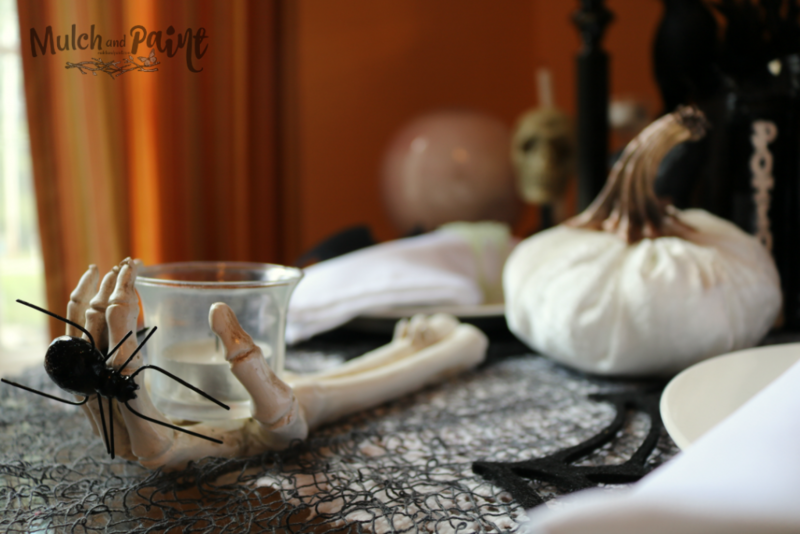 Above the table, I hung a mirror and placed a large, hairy spider on it. 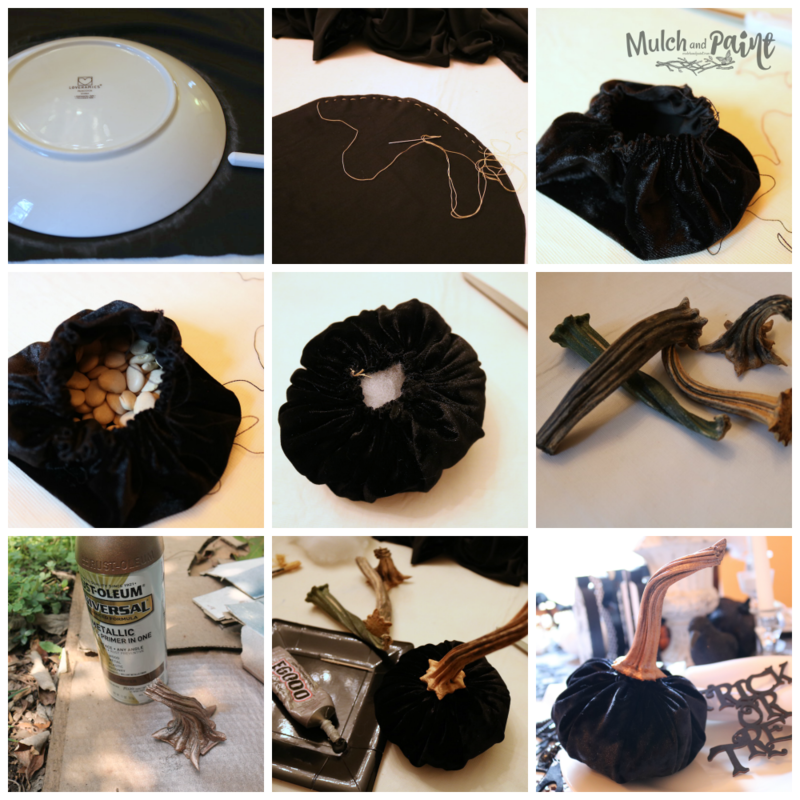 The black wreath was made by simply wrapping a black boa from the Dollar Tree around an embroidery hoop. 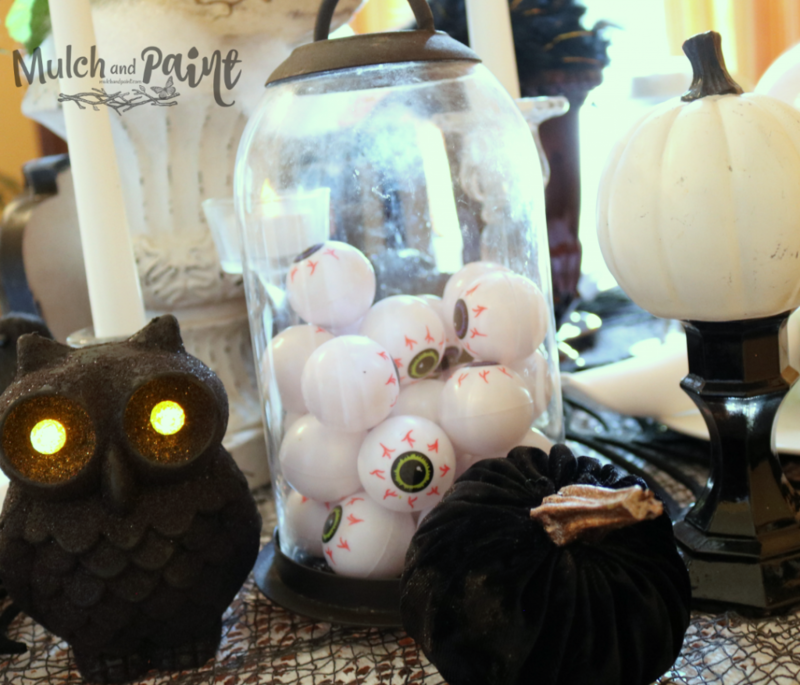 Another Dollar Tree find were the eyeballs that I put in a cloche. I used two bags of eyeballs. The owl with lighted eyes I got at Michaels last year. 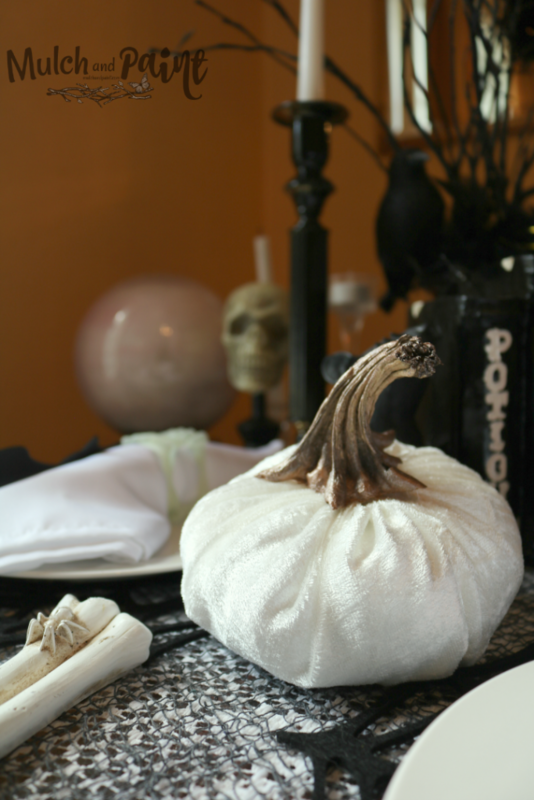 Another of my handmade velvet pumpkins is sitting in front of the eyeballs. 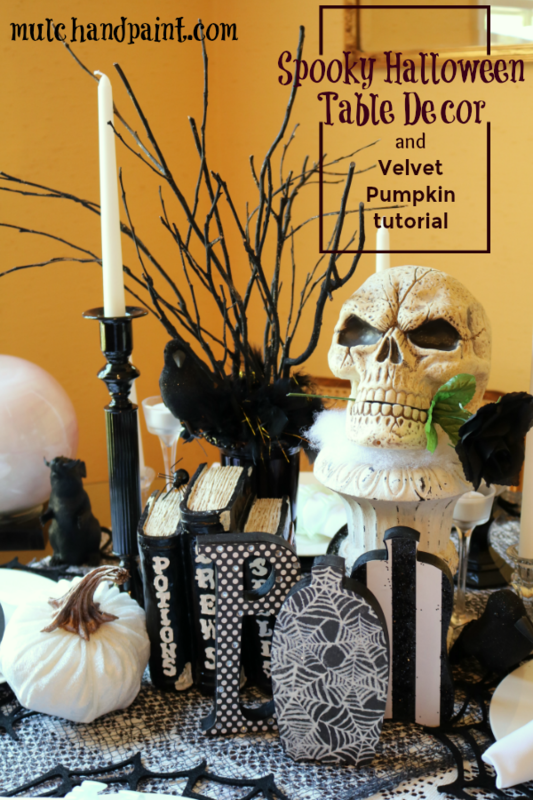 The velvet pumpkins can get quite expensive at stores so you definitely want to make them yourself since they are quite easy to make. 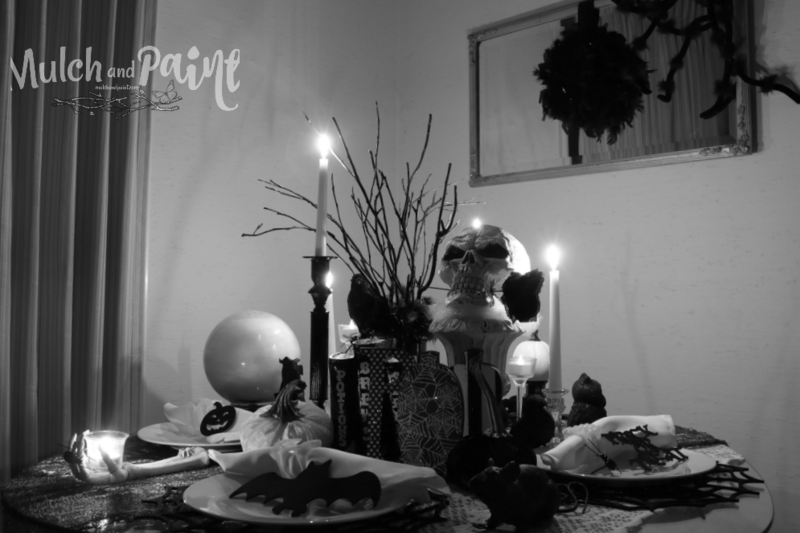 I began by laying the velvet fabric with the velvet side down on the table and sat a plate on top to use as a pattern. Since this fabric was black, I used chalk to trace the circle. With lighter colored fabrics, I simply use an ink pen. I cut the fabric into a circle and began to stitch around the perimeter (as shown). I chose a lighter thread so I could see it easier. Once the stitching was done, I carefully pulled each side of the thread to make the fabric gather in pleats. To give the bottom of the pumpkin some weight, I poured some dried beans inside and filled the rest of it with pillow stuffing. I didn’t include a photo of the next step, but I pulled the thread as tightly as possible once it was filled and then ran the needle back and forth across the top and tied the two ends of the thread together to seal it. I waited until I had the pumpkin stuffed before I chose the stem. I was shocked at how small the pumpkin ended up. (The second pumpkin I made was larger because I used a dinner plate.) 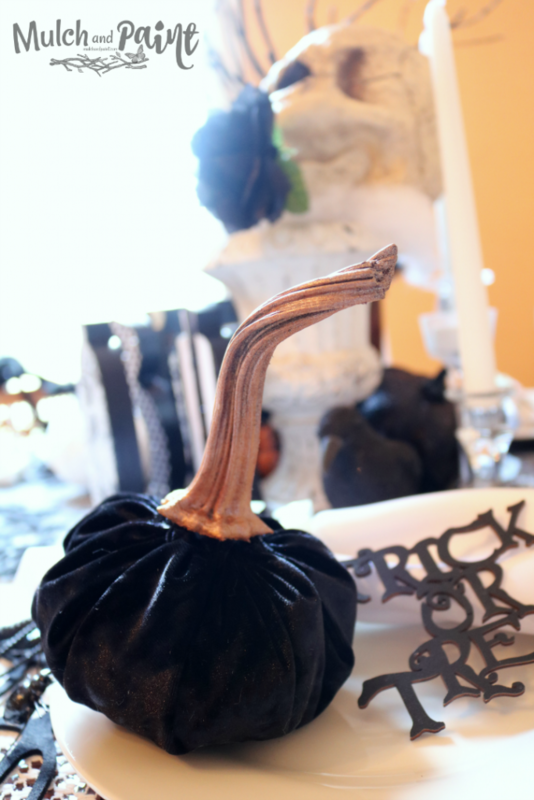 I sprayed the dried stem with copper metallic spray paint and then glued it on top of the pumpkin with E6000 glue. 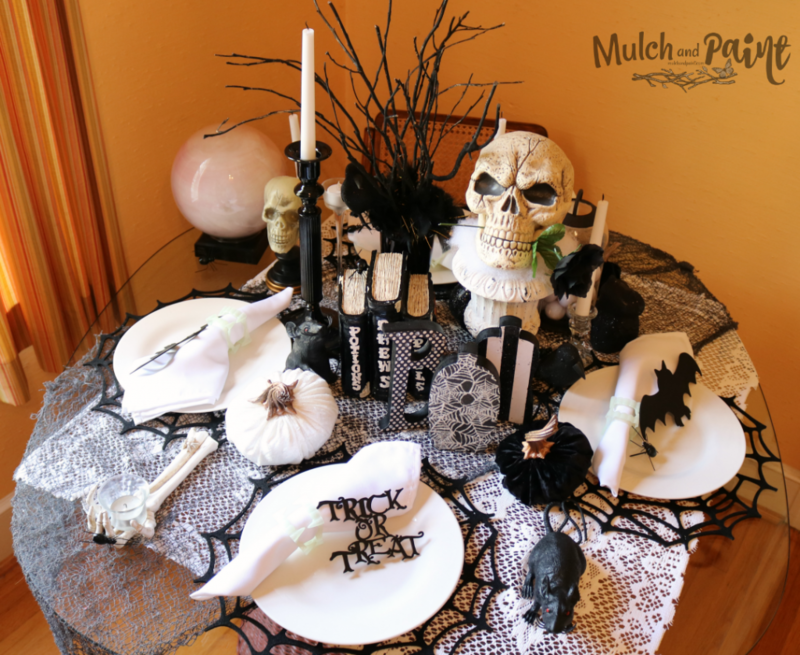 I had a lot of fun decorating this table–mainly because it was different than what I usually do. I’m really trying to get outside my comfort zone more…which is one of the reasons I started this blog. Have you been wanting to try new things? If so, start making changes today. Small steps will still get you to your destination–just don’t be afraid to move. I appreciate you coming by today to visit! 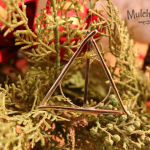 May you have a blessed day and find your motivation to try new things and explore your talents!